Stock futures are trimming gains but remain in positive territory after a weekend loan agreement for Spain's banking sector. NEW YORK (TheStreet) -- Stock futures were trimming gains but remained in positive territory Monday as a weekend loan agreement for Spain's shaky banking sector provided relief on the European debt crisis. Futures for the Dow Jones Industrial Average were ahead by 52 points, or 80.8 points above fair value, at 12,555. Futures for the S&P 500 were up 4.9 points, or 8.2 points above fair value, at 1327, and futures for the Nasdaq 100 were rising 10.3 points, or 13.5 points above fair value, at 2567. 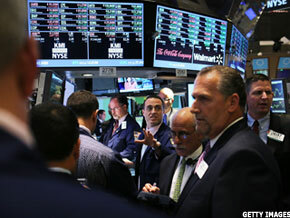 U.S. stocks got a boost Friday after President Barack Obama spoke out against Greece leaving the eurozone. The positive trading action came ahead of a weekend that would feature a raft of economic data from China and a potential banking sector aid request from Spain. Spain reached a deal with eurozone finance ministers over the weekend for up to €100 billion ($125 billion) in financial assistance to help boost its banking system. A formal request from Spain is expected to occur after June 21, when two independent audits of the banking system are due. The agreement fueled a relief rally across global markets. The Hong Kong Hang Seng Index finished higher by 2.4% and the Nikkei in Japan added nearly 2%. The FTSE in London was up 0.9% and the DAX in Germany was rising 1.9%. "The fear remains, however, that any respite for the euro area debt crisis may prove only temporary," noted Michala Marcussen, head of global economics at Societe Generale. "In focus this week is the June 17 Greek election; next comes a flurry of meeting ahead of the 28 to 29 June EU European Union Summit." The release of stronger-than-expected China trade data was also helping to fuel the rally. No major U.S. economic reports are scheduled for Monday. July crude oil futures were up by $1.16 at $85.26 a barrel. August gold futures were up $2.10 to $1,593.50 an ounce. The benchmark 10-year Treasury was shedding 8/32, raising the yield to 1.662%. The dollar was easing by 0.5%, according to the dollar index. In corporate news, Apple ( AAPL kicks off Monday its Worldwide Developers' Conference, where the tech giant is expected to launch several new products, including new computers and a new mobile operating system. Apple's next mobile operating system, iOS 6, is expected to be one of the main attractions at the event. >Shares of Apple ticked up $4.30, or 0.74%, to $584.62 in premarket trading Monday. General Electric ( GE is considering breaking off big chunks of its lending business, GE Capital, The Wall Street Journal reported. Top executives are looking at possibly selling businesses in GE Capital's consumer-finance portfolio, such as private-label credit cards or showroom financing for products like snowblowers or lawn mowers, according to three people familiar with the company's thinking, the Journal said. The moves reduce the size of GE Capital's loan portfolio by as much as 16%, according to the newspaper. GE shares rose 1.25% to $19.44 in premarket trading Monday. Johnson & Johnson ( JNJ announced Friday it anticipates it will record a one-time charge in the second quarter of about $600 million related to litigation regarding Risperdal, Invega, Natrecor and Omnicare. Shares of Johnson & Johnson ticked up 2 cents, or 0.03%, to $63 in premarket trading Monday. Federal regulators have cleared Duke Energy's ( DUK proposed takeover of Progress Energy ( PGN. The merger will create the nation's largest electric utility.